Go here and then click on the game of your choice for audio breakdowns. No. 12, as in Danny Pertusati or as in where Damien ranks in the Inland Division? Aram thoughts: Here’s my problem with this. Lets say that Damien beats current No. 4 Chino Hills next week, the Spartans will obviously join the rankings, but where? If Chino Hills wins, you can bet your mortgage payment the Huskies will be one of the Top 4 seeds in the playoffs. But what about Damien? Will the Spartans go from unranked to being one of the Top 4 seeds in a matter of a week? That’s probably not going to happen. Considering how tough this division looks, it would be a great advantage to be a Top 4 seed and it doesn’t look like Damien will be that, even with a win. That means the road to the finals won’t be as easy as it should be. What stuns me is that Rancho Cucamonga is the “other receiving votes” not Damien. Not good for the Spartans. Why take the long road when you can take the scenic route? The handwriting was on the wall about Chino Hills property values, and you did nothing. Here are the latest power ratings. These are from calpreps.com … laugh all you want, but at this time of year, I actually put some stock into these digits. Aram’s thoughts: There’s a very real possibility that if Rowland wins out and Los Altos is the No. 3 team in the Miramonte League, those two teams could meet in the first round. Think of it, the Battle of the 60-Freeway. I tell you what – I’d spend that entire Friday in the ‘Heights. First, I’d visit my grandmother’s grave in Rowland Heights, then I’d wack out some dim sum for lunch and then a little Sam Woo right before the game. Why do I get the feeling that nobody does the SGV as well as I do? Anyway, it’s obvious the Miramonte and SAL teams are going to be substantial underdogs in the playoffs to Century and Sea View League powers. But that’s OK. Speaking of the Southwest Division … no surprise it’s one of the toughest in SoCal. Ahh, the old D-6 is going to be a throwdown. Come on SGV ballers, somebody get me to Home Depot Center! Kids, sit down! Save your applause for the 100,000-hit month. It’s coming. NUMBERS DIGESTION: Some people in our ownership group have accused me of having a big family. Nope, believe me that’s not it. It’s just that the SGV prep sports fans are the best around. I can remember when I used to wonder about when this site would reach 100,000 hits, total. Now, it’s not a wild monthly goal. This blog gets considerably more hits month after month. September had around 57,000 hits. We have almost 20,000 more this month. If this keeps up, maybe we’ll do 100,000 hits in a month. Anyway, like I’ve said before, this is great exposure for our area athletes and it’s good for killing time while at work. How can you lose? This is by the L.A. Times’ Eric Sondheimer. And it’s also available on their prep sports site. Call it a public-vs.-private schools feud that is simmering, if not starting to boil. It has come to the point that Newhall Hart Coach Mike Herrington, a member of the Southern Section football advisory committee and someone respected for his calm, clear thinking, says he’s ready to propose that the Southern Section create separate playoff divisions for public and private schools. “The equality is not there,” Herrington said of the current alignment. Front and center in the debate are Westlake Village Oaks Christian and Ventura St. Bonaventure, private schools that were placed with public schools in the Tri-Valley and Channel leagues, respectively, and aren’t just winning but wiping out the competition. In Ventura County, the public school coaches are fed up. And now Herrington, after four consecutive losses to St. Bonaventure in nonleague games, is wondering if the unlimited attendance boundaries enjoyed by private schools is too great an advantage to overcome. Herrington said that as media coverage has expanded because of television and the Internet, private schools have gained added exposure. Public schools were given a brief boost when the state legislature passed the open-enrollment law that took effect beginning with the 1994-95 school year. It allows students to attend any public school within their school district, regardless of where they live as long as there is room. And that’s the problem today. Open enrollment has fallen to a trickle in many districts because of space limitations. That leaves an unequal playing field, at public and private schools. In the Los Angeles Unified School District, high schools that still have open enrollment slots continue to attract athletes for top programs, such as Chatsworth in baseball, Woodland Hills Taft in basketball and Lake Balboa Birmingham in football. Other schools that want to offer open enrollment spots can’t because they’re overcrowded. Private schools have complained that they are at a disadvantage because they charge tuition, but financial aid, or “scholarships,” as coaches like to say, have become commonplace. Bill Redell, football coach at Oaks Christian, has grown frustrated with the continuing criticism of his program and said he would support a separate playoff division for private schools. Setting up such separate playoff divisions would be such a complicated task, its chances of happening are improbable, Westlake Village Westlake football Coach Jim Benkert said. In Honolulu, there are separate football leagues and playoffs for public and private schools before they join for a Hawaii state championship tournament. But there are 28 public and 26 private high schools on Oahu compared to 360 public and 204 private high schools in the Southern Section. In Chicago, there’s a public school league and a Catholic school league, and the top football teams from each, if they are not involved in the state playoffs, play each other at Soldier Field at the end of the season. . Whether this issue is important enough to attract interest from many schools in the Southern Section remains to be seen. That may be because many coaches have given up hope that something can be done. Or, for some, the problem was temporarily resolved during the last go-round or league realignment, when many private schools were grouped in the same leagues. What’s certain is, if someone as respected as Herrington has concluded there’s a disparity problem, others are sure to agree. In December, six football teams will be invited to participate in the first CIF state bowl games. If the majority of the teams playing in the three games are from private schools, that “will probably fuel the debate,” said Marie Ishida, CIF executive director. The animosity level is rising among coaches and parents, and this issue can’t be ignored. What’s happened to Brigham Harwell? It’s not just about blowing games for Karl Dorrell, it’s about blowing careers, too. I’m not a football coach, but you don’t have to be to tell that Brigham Harwell is playing out of position at UCLA. Harwell’s senior year at Los Altos was my first year on the beat. I only got to physically cover his games twice and I got to interview him multiple times for his Player of the Year and Signing Day articles. Harwell told me before he told anyone that he was going to UCLA. Fox Sports Net showed up at 8 a.m. at Los Altos to get footage of Harwell deciding between UCLA and Arizona State on the morning of Signing Day. But, Harwell had told me before any media outlet that he was going to UCLA. It was in that morning’s paper hours before he decided to let LA’s mainstream media know. That’s the best scoop I’ve ever had. He did it because the Tribune had given him great coverage and he was thankful. Also because coach Greg Gano is a class act. FSN wasn’t happy about the leak, but who cares? I liked Harwell, just like anybody who meets him does. He remains the best, most dominant defensive player I’ve ever seen in high school. For those reasons, and because I have a signed UCLA helmet from him as a token of appreciation, I am a huge fan of his. These days, however, I am a disgusted fan of his. Harwell left high school as one of top prospects in the nation. The SGV has had big time recruits before, but nothing recently like Harwell. He was Top 20 in the country on most lists. He was the gem of UCLA’s recruiting class and a player unlike anything Dorrell often gets. Harwell was deciding between UCLA and ASU at a time when former Sun Devils defensive end Terrell Suggs was still fresh in the minds of PAC-10 fans. He’s now a Baltimore Raven. I was excited at the prospect of seeing Harwell play in my local media market. I was excited, just like any prep sports writer, to say “I covered that guy.” I’ve heard past Trib guys talk about covering Lawrence Phillips, Daylon McCutcheon, Jason David and so on. Harwell was going to be my guy. Then, he arrived at UCLA. Then he got moved inside for some stupid reason. A finesse, pass rushing defensive end that dubbed himself (and I wrote it) “The Sackmaster” was moved inside. Not only is Harwell not big enough to play inside, his remarkable speed isn’t best utilized inside. Most schools prefer 320-pounders plugging up the middle. UCLA prefers a 275-pounder, who had to gain weight to get there, not lose it (as most interior linemen do). Harwell has had his moments at UCLA, but it hasn’t been what it should’ve been. He hasn’t turned into the next Dwight Freeney or Terrell Suggs. Instead, he’s suffered through some injuries, some of which might be because he’s out of position. He’s suffered through playing a position that he splits time at. He’s suffered through Dorrell and staff making it so that one of the country’s former top recruits hasn’t matriculated into being the dominant force he could’ve been. In a QB-happy conference like the PAC-1O, wouldn’t a speed rusher off of the edge be ideal for a defense? I wonder what might have happened to Harwell had he chosen ASU. Maybe they would’ve never tinkered with his position. Maybe he’d be considering leaving early after this season. Maybe he’d be the next Terrell Suggs. CO downed Bo-Hi and it’s looking like a two-horse race in the Miramonte with D-Ranch. 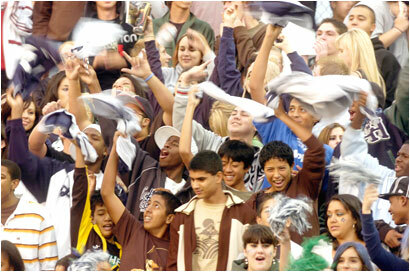 Aram’s Baldwin Park vs. Covina thoughts: First of all, I want to say how impressed I was by the fan support Covina had. It might have been because of homecoming, but I hope that’s the type of crowd the Colts always get. To the game – it went just how I thought it would. Covina’s offense wasn’t stopped and it was going to take BP trading points to stay in it. Having said that, I was impressed with BP’s QB Angel Acevedo. He has some speed when he runs and he throws pretty well. I think that Coach Heggins has done a good job there. From where BP was to where they are now is nite and day (Al B. Sure). Anyway, what can you say about Covina? The offense is rolling again. Mike McDonough is a monster. This guy really just can’t be stopped. The Colts run the ball with him or Tre McNair or they throw it deep. There was no in between last nite. The funny thing is that whatever they wanted to do, they did. If they threw deep, then Brad Gomez was wide open. If they ran McD or McNair, then they got yards. Like Heggins said “Pick your poison.” As I’ve said before, outside of Amat or Damien, the rest of the SGV teams are dreaming if they think that Covina wouldn’t give them a game. Players like McD, McNair or Jamal James would play for anyone else in the Valley, no question. Everyone I’ve spoken to already has Covina penciled in to be playing Oaks Christian in the finals. I wish I knew what the rest of the division looked like. It seems to me that if Covina is the No. 2 seed, they’ll probably have to play Oak Park to get there. I wouldn’t go too crazy on postseason projections for the Colts yet because the rest of the division is a question mark that nobody can answer. Covina is very, very good, though.